We met another friendly bike tourist in the El Capitan State Beach hiker/biker site. The five of us shared the giant hiker/biker site with its beautiful ocean view. As we’ve noted in a previous post about last year’s Pacific Coast tour, bike tourists who meet on the road often have little pet names for their fellow two-wheeled travelers. We named the friendly guy we met in El Capitan, “Mr. California”. When we inquired about his hometown, he replied “California”. He went on to list the real estate he owned up and down the California coast including houses in Ventura, Del Mar, San Francisco, Sonoma County and a couple other places. Mr. California had just ridden up from Ventura and was thinking of heading south again because of the heat wave. He had no interest in following the hot route inland we had just come from where the temps were still hovering in the low 100s. Mr California also gave us a tip that we filed away for a possible future tour: one way to avoid the “California crazy drivers” (his words not mine) is to ride mountain trails. On a horse or an off-road bike, riders can apparently pick a route from San Francisco to LA on lonely, vista-rich fire roads & dirt trails! Maybe we’ll have to try that some day as it sounds like an ideal way to travel. He then filled us in on the SoCal bike touring and transportation cycling vibe and prepared us for the riding to come: lots of car traffic, irreverence for anyone on a bike and crowded, rather unpleasant campgrounds. He presented this information in a matter of fact way, not really complaining, just stating the facts. We’d heard the same thing from other bike tourists and knew this was the reason most Pacific Coast riders stop somewhere around San Luis Obisbo or Santa Barbara. GRIT — finishing what one starts; completing something despite obstacles; a combination of persistence and resilience. In the name of grit, unpleasant roads and camping or not, we were determined to finish the tour! Higher temps at the ocean meant more uncomfortable riding for the third day in a row. Since the day included no major climbs and our planned distance was relatively short, we took advantage by stopping often. We stopped for cold drinks, we stopped to rest in the shade, we stopped to reapply sunscreen and we stopped for burgers, fries and shakes in Santa Barbara. It took forever to ride 32 miles! With all of the stops, we arrived in Carpinteria, 12 miles south of Santa Barbara, at around 4:00 PM. two hours later than planned but just in time to catch their quaint, small town Fourth of July parade. I do love a parade! You can really get a sense of a town from its annual parade. And this one included some gems. 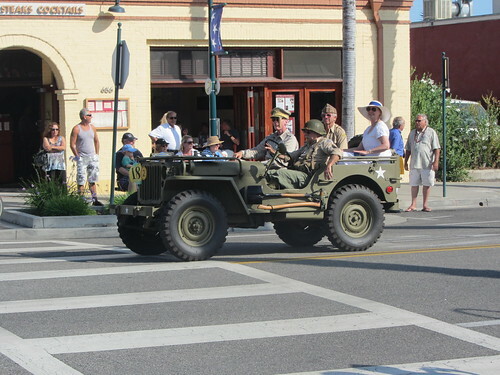 Along with various army vehicles, it included requisite local politicians and real estate agents driving and riding in shiny convertibles waving to all the spectators, little girls in tutus from the local dance studio, and lifeguards from the town pool. After the parade, we headed over to the grocery store for dinner and breakfast food. Since the Carpinteria State Beach campground was mere blocks from the store, we didn’t have far to go with our purchases. We loaded up our cold pannier (we’ll post about that soon) with ice, beer, cold drinks and dinner food for our planned picnic on the beach. Mr. California had warned us that not only did the riding get worse the further south you traveled, but the hiker/biker camping did too. 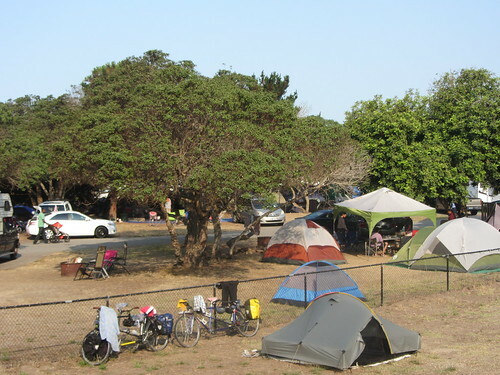 The hiker/biker site at Carpinteria was definitely less plush than the one at El Capitan. 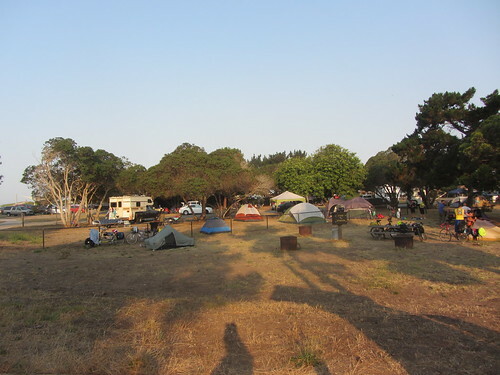 It seemed like the park just took some extra space outside the regular campground they weren’t using for car/RV camping and just called it hiker/biker. The area was pretty run down and filled with gopher holes. After the kids saw a few gophers popping out of one of the many holes, they got worried that a gopher was going to chew through our tent while we were sleeping. The site did have picnic tables and fire pits, a luxury we learned not to expect the further south we traveled. Hiker/biker was also occupied by various characters who had arrived by bike and foot including a guy who cracked beers and started smoking cigarettes at 7:00 AM the next morning. We were happy to see Danielle and Henry’s tent set up in the site and looked forward to seeing them again. We were also pleasantly surprised that the rangers at El Capitan agreed with our family’s per bike argument. They ended up discounting our stay, $30 instead of $40 for four people. We appreciated their willingness to listen to our story and for understanding our unique family bike situation. After we set up camp, we wandered down to the beach for dinner. Despite the Fourth of July crowds and tailgate/spring break party atmosphere in the campground and on the beach, we enjoyed a nice wholesome family picnic. The kids swam, the parents shared a couple of beers, we ate dinner and we all watched the sunset together. After showering and before we retired to the tent for the night, the kids and I participated in the campground’s ranger program and learned about the Channel Islands National Park and it’s unique wildlife. 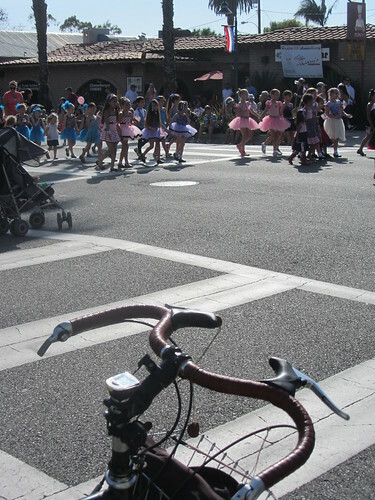 Low: The riding wasn’t ideal — more traffic and a route that followed various meandering bike paths. This entry was posted in bikes, Pacific Coast Bike Tour and tagged 2013, acapaccoast, bike tour, bike touring, bikes, CA, carfreedays, Carpinteria State Beach, family bike touring, Family Cycling, kids, Pacific Coast Bike Tour, Santa Barbara, tandem, tandem bike tour, tandem tour, two tandem bike tour. Bookmark the permalink.